This article documents a comparative thrust test of a stock Hobbywing X-Rotor 40A, Hobbywing X-Rotor 40A with BLHeli firmware and a Hobbyking 9261000003 40A with SimonK firmware on a medium sized motor at wide open throttle (WOT). 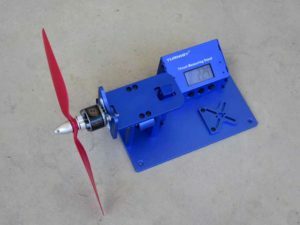 The X-Rotor 40A out of the box then a throttle cal for 1030/2000 performed. Above, the motor and prop used for the test.